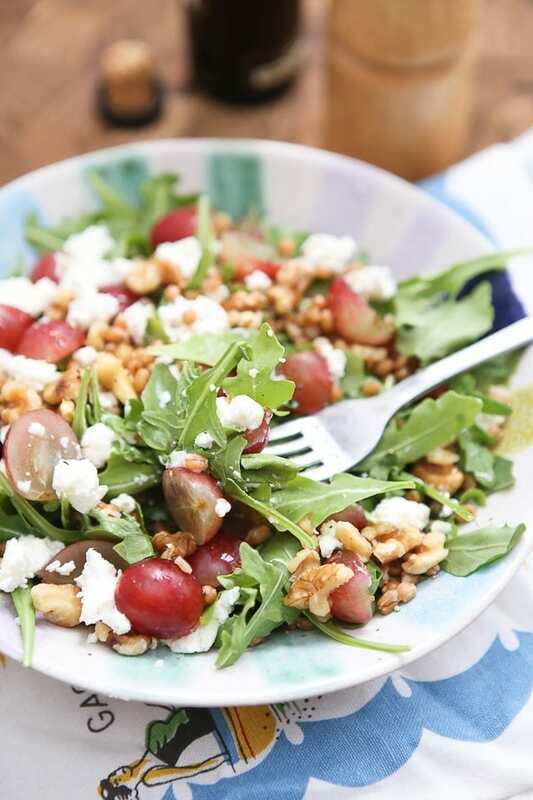 Packed with taste and nutrition, this Wheatberry and Arugula Salad with Grapes and Nuts will quickly become your new favorite salad! I’ve been intrigued by wheat berries for some time now and finally have gotten around to getting my hands on some. You all know how I feel about salads, so it was only natural for me to use them to bulk up a salad I was craving recently – a salad that had to include arugula, grapes, nuts and a little goat cheese. Let me officially introduce you to my new favorite salad – Wheat Berry and Arugula Salad with Grapes and Nuts. 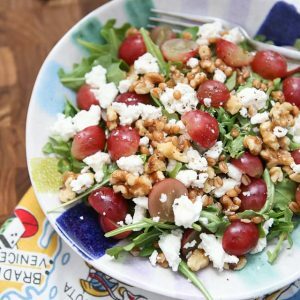 This month’s Recipe ReDux happens to be dedicated to all things nuts, and this salad is perfect for showcasing them and all their goodness. The Recipe ReDux is a recipe challenge group started by registered dietitians and is focused on keeping healthy recipes delicious (as they should be, right?). I have loved being a part of this monthly challenge and have discovered so many new health focused blogs because of it (see recipe roundup at the bottom of this post to check out more recipes and blogs). I chose walnuts for my salad of the day, but I think pecans would be just as wonderful paired with grapes and goat cheese. It was a hard decision to make but I tend to go for walnuts when I can because I learned years ago that they were a powerhouse in the omega 3 department (for some reason I am obsessed with getting omega 3’s in whenever I can). I have a hard time not adding nuts to almost every salad I make. There are several bags of nuts in my refrigerator (I keep them there so they stay fresh). The wheat berries added a great layer of texture, making this salad even more nutritious and hearty enough for a light dinner (oxymoron?). What are wheat berries? Well, they are a whole grain with a sweet nutty flavor and they are high in protein and fiber. They remind me a bit of farro actually. Like I do most of my grains, I cooked up a batch and kept them in a container in the fridge so they were ready to add into recipes or salads just like this one. I know it’s fall and we are gearing up for colder months and the holidays but salads are my favorite all year ’round. I think the challenge with keeping salads fresh and exciting is to go with the flow of seasonal ingredients. Grapes are looking real good right now, so are pears and of course apples. If you like adding fruit to salads (I obviously do! ), those are on the top of my list of salad add ins these days. 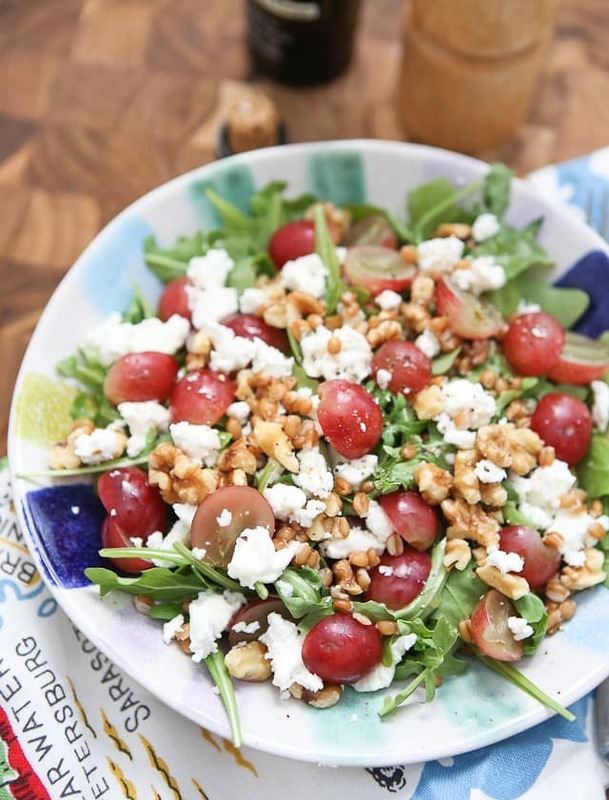 Not to mention, look how pretty they look in this Wheat Berry and Arugula Salad with Grapes! 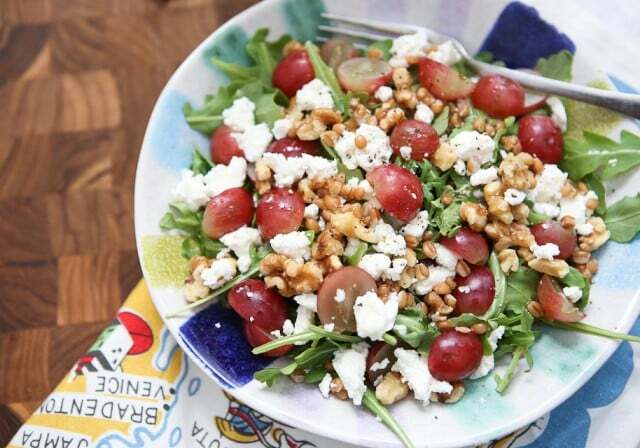 Combine arugula, wheat berries, grapes and walnuts in a large salad bowl or plate. Top with crumbled goat cheese. Splash on balsamic vinegar and lightly drizzle olive oil over your salad. Season to taste with coarse salt and fresh ground pepper. Check out the rest of the Recipe ReDux group and how each member celebrated nuts in their healthy recipes! Love this, Aggie!!!! I have to try wheat berries! And love the goat cheese and walnuts in this salad! I love throwing wheat berries in salads! Can’t wait to try this! I’m so wishing I had a bowl of this salad for lunch right now! I’m not sure I ever tried wheat berries in my pre-gluten-free days, but I think this would also be fabulous with sorghum which has a delicious chewy texture. Pinning, and definitely making soon! What a gorgeous salad Aggie – I love this! The combination you’ve got going here is perfect for Fall. LOVE-ing this salad, Aggie. Wheat berries = yum. And you are inspiring me to incorporate more grapes in my menus. Why not? My whole family loves ’em! This salad looks perfect! I love wheat berries added to salads and goat cheese is my fave for a salad too! This is glorious—Aggie! And the light in your photograph is equally beautiful. Love how you showcase grains. Perfect combo of flavors and beautiful photos. I just discovered wheat berries a few months ago and totally fell in love. They’re so perfect for salads!